What can I say, it's a piece of rope with some stitches in it. THANKS! Solves the problem of always losing your shroud cutter. Looks like rigger made. Extremely fast shipping. Great, at this price no need to start up the Singer myself. Paracord arrived today. Looks and feels great. I bought this with a large order, and a few items were not available at the time. Instead of waiting to ship everything at once, my items were shipped as they were available. Excellent customer service. This is great. Not too costly and a functional piece. 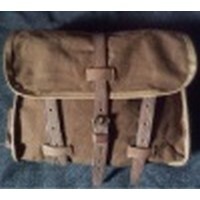 This is a great item, it is as ordered and exact recreation as it would have been made by the riggers who modified or made items for the troops. Made from paracord with the inside strands removed, tightly sewn loops, and roughly 24" long. Yes, you could make if yourself, if you already had all the materials laying around, but why bother if you are already placing an order for the M2 Knife, get the Lanyard while you're at it. I could have made this but for a little money, I saved more time. Very strong. It fits the para knife very well.